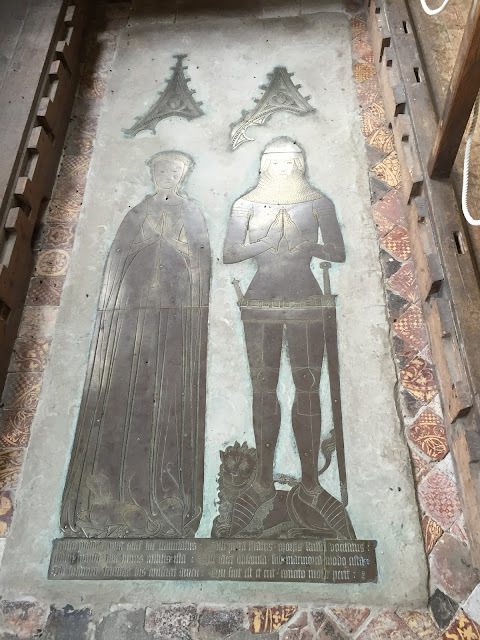 We both like visiting old churches and St Peter's Church near us at Dyrham has this fascinating memorial to a lord and his lady from the 14th century. The stone carving shows the skill of the craftsmen in those times and it's difficult to drag your eyes away from the detail. 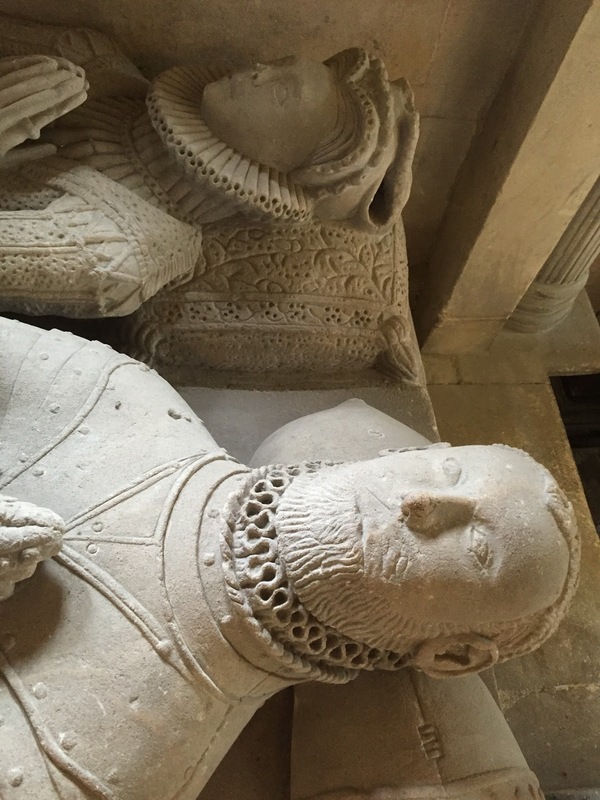 This couple will be lying side by side for eternity. I hope they got on. 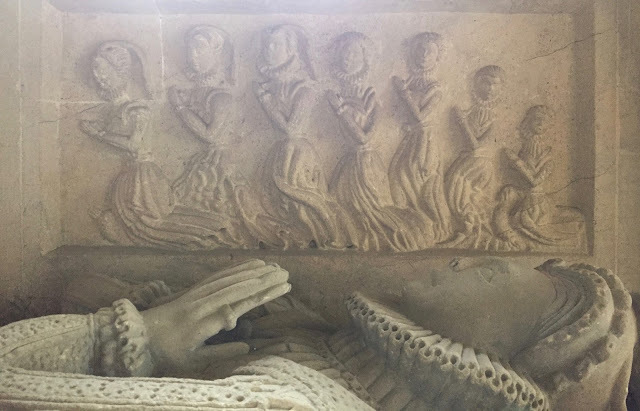 This carving shows the children of the couple in mourning and is faded out at the top because of the strong sunshine spilling in from the window above. It's a very lovely church with more natural light than usual. 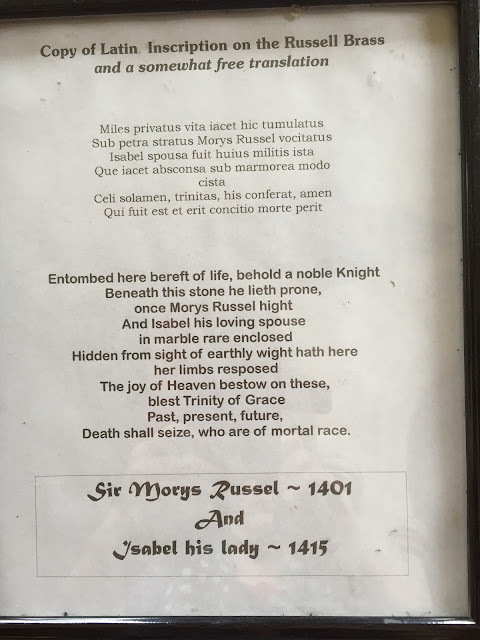 The inscription below is described as a somewhat free translation. 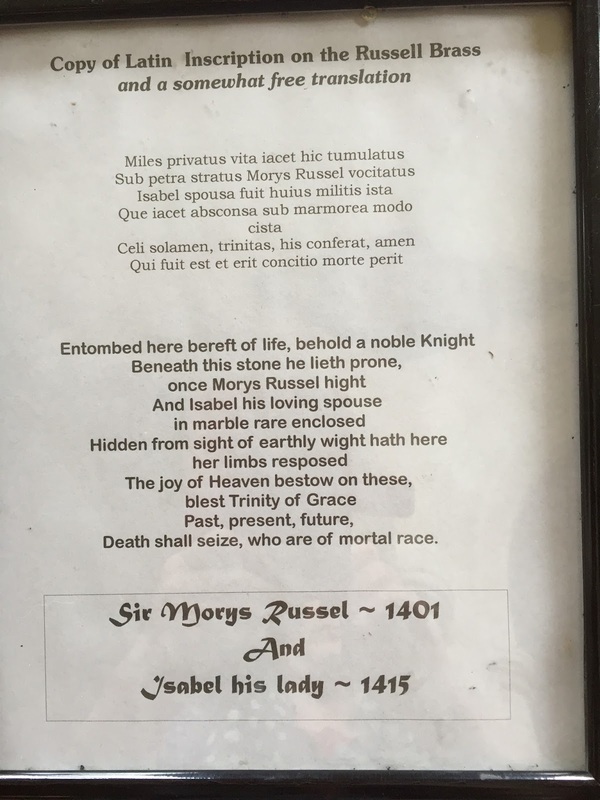 My even freer translation (before we discovered this framed version) went something like - "Privately buried here in the tumulus and sub-prime stratus is Morris Russell's victorious wife who was very military. " I don't speak Latin. 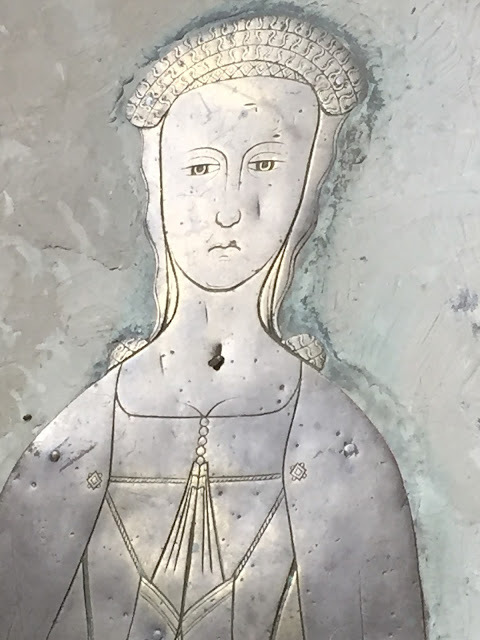 Here are they are represented in a brass embedded in the floor and neither of them look very happy about it. Morris looks particularly cross with his downturned mouth. Or it could be a moustache? And if it is a moustache, did he also have a beard and if so, where would he have kept his beard? 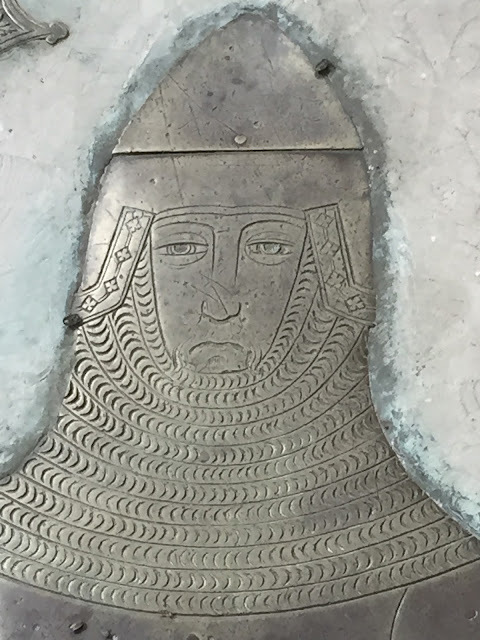 Inside or outside that elaborate armour which protects even his chin? If inside, I imagine it would be quite itchy. If outside it would look ridiculous because I doubt it would like flat in a dignified way. It would stick out surely? Again there was a lot of light spill but you get the idea. It's a beautiful brass and I was quite taken with the tiles in the surround. And for a final "oooh", as we were leaving, we noticed this. It's a replica of a coffin wagon. I'm sure there's a better name but as I've only seen anything similar in Thomas Hardy TV adaptations it was very interesting to see one up close. It's not too big a stretch for the imagination to picture this sorry little cart jolting over the lanes, being dragged and pushed by mourners on the way to the church. Outside the church again in the sunshine, here are some doggie pics. Our scruffy pup is coming up to his first birthday. He's taken us by surprise in the way he's become such a big part of the family. We (try to) teach him manners and to stay on four paws when he greets people. We hide his plastic balls in a special drawer because otherwise he torments you by dropping it at your feet and looking cute until you get dragged into playing fetch for 10 mins when are supposed to be doing other things. We try and keep his coat neat and tangle free but he prefers to chew the brush so that gets hidden too. Mostly, we try not to spoil him. That's been more difficult since he was so ill this spring that he spent 4 nights in hospital and we didn't know if he'd come home again. 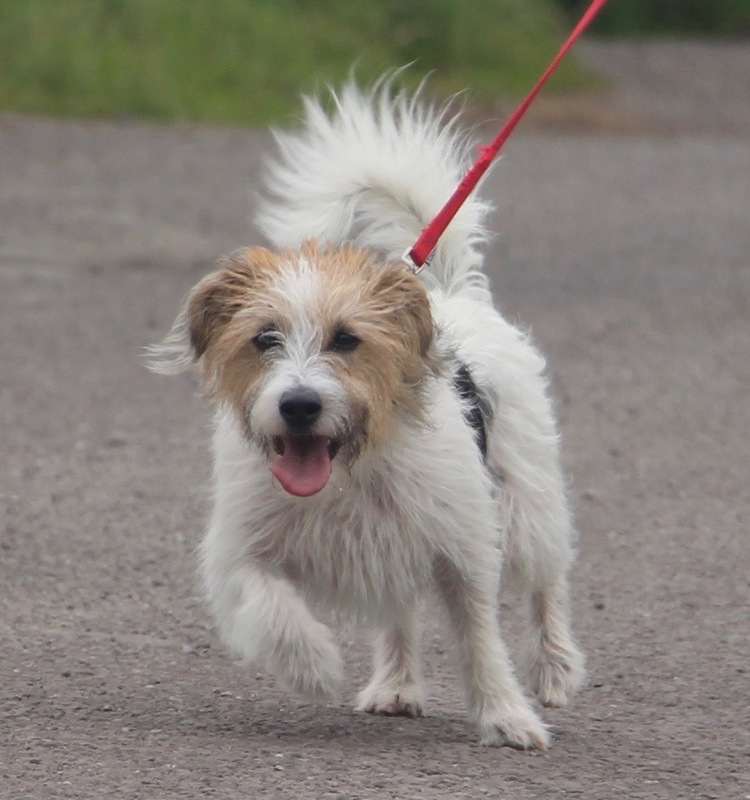 But he bounced back to full health and is allowed off the lead now in certain safe places and has (nearly) the run of the house because he's house trained and rings his bell by the front door if he needs "private time". That doesn't save the toilet roll if we accidentally leave a door open or slippers, shoe insoles, socks (what is it with dogs and socks?!) tissues, paper or the occasional book. 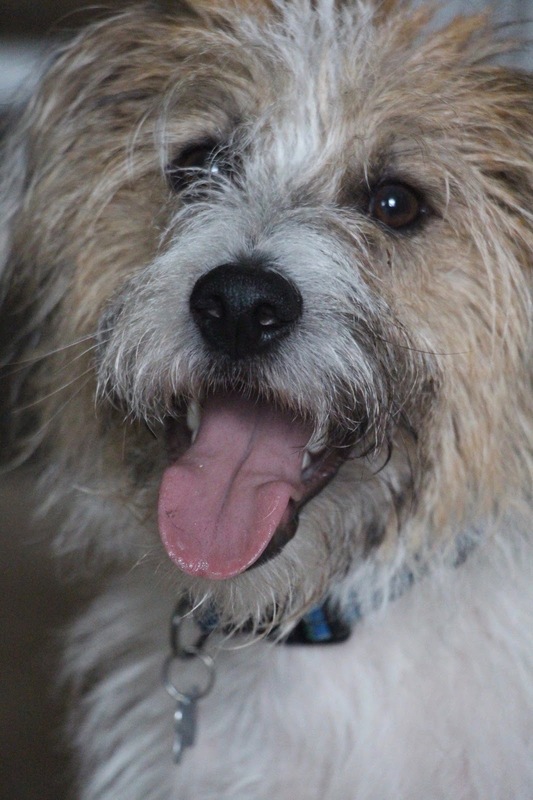 He can open some doors and gleefully pushes his way into bedrooms in the morning and wakes the sleeping occupants by jumping on them and giving them his special slurpy doggy kisses. Bless. Oh, I love a good church! 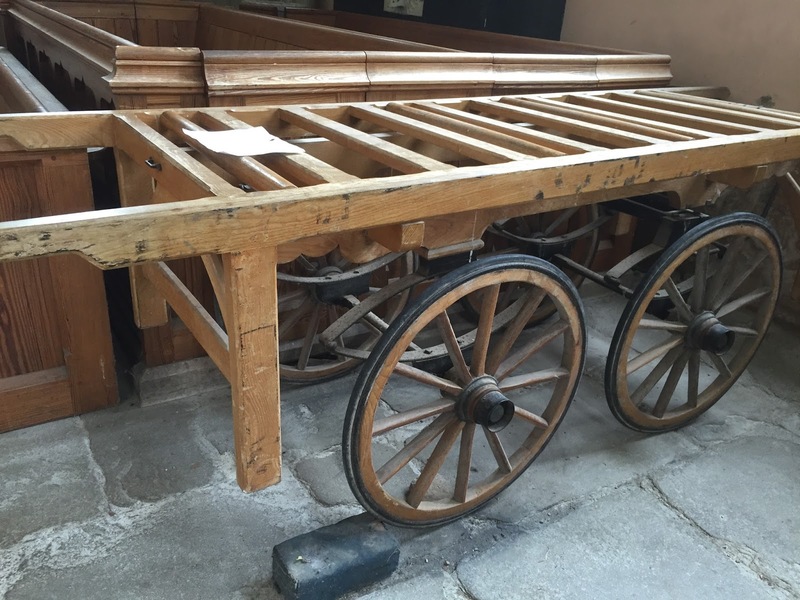 I think the coffin cart sas known as a bier, but I may be wrong. Fabulous brasses!